The best drug, in the best container, with the best delivery device is useless if the patient does not take the medication in line with the appropriate regimen. Lack of adherence not only costs pharmaceutical companies $564B in revenue each year, $188B in U.S. alone, but it is also one of the main drivers behind poor patient outcomes. The reduced dose frequency of biologics, the increasing complexity of new and existing treatments, and the shift to more choice and decision-making responsibility residing with patients and payers means innovation in drug delivery is key to overcoming barriers to adherence and improving patient outcomes. 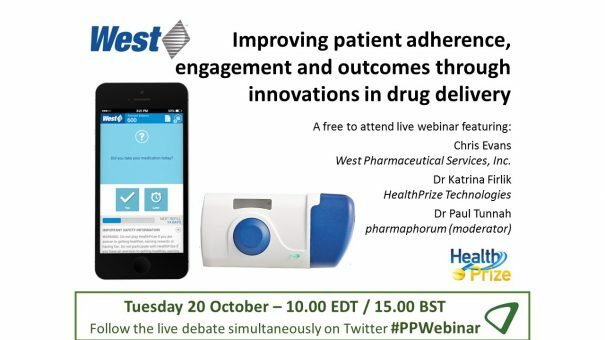 Hear from West Pharmaceutical Services, Inc.’s Chris Evans and HealthPrize Technologies’ Katrina Firlik on how their organisations are collaborating to provide an end-to-end connected health solution that tracks, educates, motivates and engages patients to increase adherence and medical literacy and rewards them for compliance with their prescribed regimen. The live broadcast took place on Tuesday, October 20. To view the on-demand version, please click here or on the webinar widget below. Chris Evans, Vice President, Research & Innovation, West Pharmaceutical Services, Inc.
Chris is Vice President of Research & Innovation for West’s Pharmaceutical Delivery Systems business and has been in product development for over 20 years, primarily in healthcare packaging/device development. He is responsible for new product and technology development, focusing on enhancing the patient experience. He also manages West’s Connected Health Initiative and the ongoing strategic alliance between West and Insight. The holder of 19 U.S. patents with several more pending, during his first decade in the business he concentrated on the manufacturing, engineering and commercialization of new products. Since then he has principally worked more on the ‘front-end’ of innovation, managing teams for discovery/user research, human-factors, conceptual and intellectual property development.